SP Minipumps for 1Kg SP106 SP320 SP115 & Eposeal 300 Epoxy Resin Kits. Each pump body of the pair is identical and will fit either container of the SP 1kg resin systems SP106, SP320 and SP115. 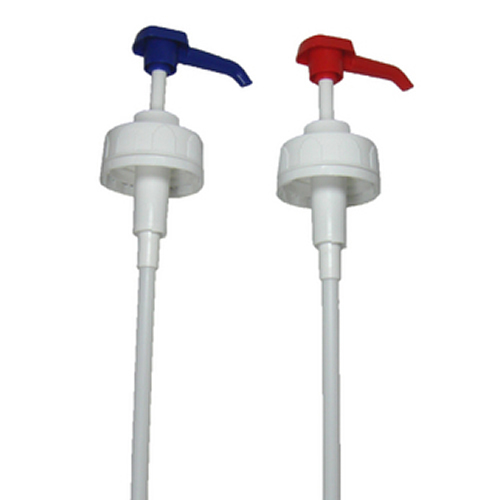 However, each pump of the pair is fitted with an extension tube of correct length to reach exactly to the bottom of one container, so that there is a ‘resin pump' and a ‘hardener pump'. Each pump dispenses the same quantity of liquid (approx. 5ml) and therefore correct ratio is made by a number of strokes equivalent to the mix ratio on the resin pump (eg 5 strokes for 5:1 by volume mix ratio) for every one made on the hardener pump.